As you may have noticed, I just got this new domain from Blogger. I was inspired in naming it Meet and Greet as it is a reflection of my family. This blog used to be "The Adventures of The Corsames" but later on got convinced to replace it with something general, something easy to remember. Oh well, I hope I am right in this. Anyway, this is my first entry for Camera Critters. 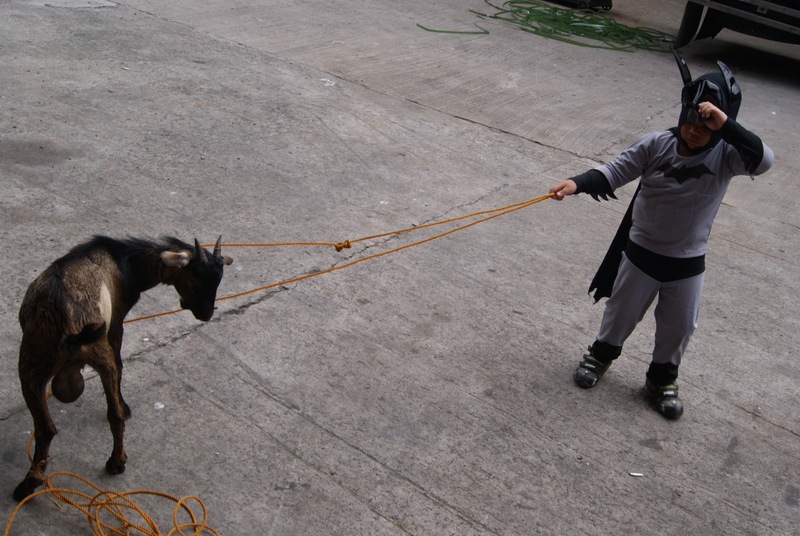 Please meet and greet the new member of our family, our latest pet - TIMMY D' Goat. The name is given by my son Christoph. I dont know why but anyway the goat is now Timmy. My boys are really scared of animals. So this is our way of introducing the animals to them. Uncle C purchased Timmy for the boys at Php 3,000 (USD 70). We wanted to buy also a female goat but not available yet. 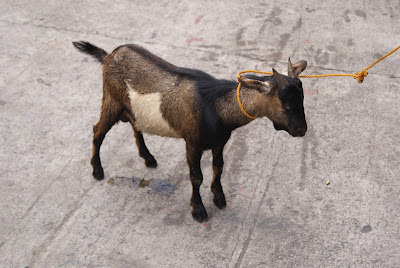 Apparently, these goats come from Negros and now in the city for you-know-why. For eating of course. What a pity! We then asked the driver to pick up the boys before going to their Costume Fun Day in school. You can see Christoph pulling Timmy. Now the boys are always excited to see Timmy but for now Timmy has to stay in the warehouse first. When I was small my father also bought 2 goats to be slaughtered for his b-day, but then they found out the female goat was pregnant, so she was saved and gave birth, that became our pet.But they were sent to the province, you know nmn in the city mahirap mag-alaga ng ganyang pet. What a neat pet for the family. My neighbor had goats that would keep his field of grass mowed for him.